A must workshop to attend that mixes the International and India experience suitably. This summer and monsoon will see a double bonanza for the fundraisers in India. 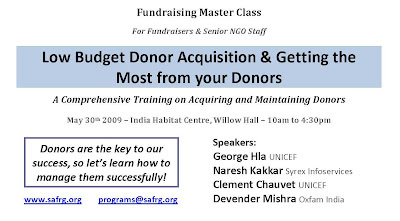 Two big International Fundraising Workshops are happening right here in India. The first one organised by Resource Alliance is at Bangalore in the month of June. And the second one in August is being organised by South Asian Fundraising Group at Jaipur. Does your Charity has a cause not interesting enough for Donors? How often one hears that. I have come across several NGO leaders mentioning that their cause, their work, is not often interesting enough for individual donors. And hence they keep on chasing funding agencies and in some adhoc fashion certain corporations for funds. A new email campaign from GreenPeace India may help us in making uninteresting interesting. Now basically, what GreenPeace needed money for was an advertisement. Surely, not an interesting thing to ask money from donors,especially individuals. 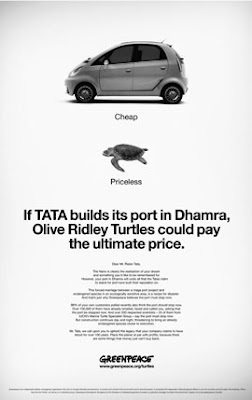 2) It talks of a holistic solution to stop Tatas. Moreover the communication gives an opportunity for people to become activists (see http://www.isrworld.org/2009/05/perfect-isr-giving-people-chance-to-be.html). Really amazing. I would love if GreenPeace shares how this did in terms of raising money and votes. Click below to see the emailer for your self.